Home » Divination » What Is Black Magic? 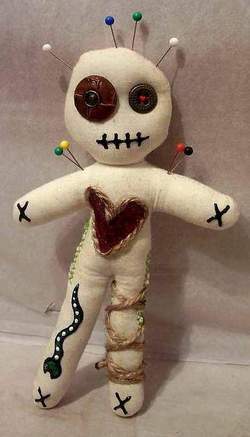 Black magic… The term conjures up images of darkly robed folks in sinister rituals making human sacrifices, or Voodoo practitioners hunched over odd little dolls with scraps of some unfortunates clothing pinned to it. But what is black magic really? How does it differ from ‘white’ magic? There is no one method or practice of the magickal arts that is, in and of itself, black magic. Nor is any specific application of magic in and of itself ‘black or white’. Magic, like all forms of power, is neutral. The morality of it’s use is strictly in the intent of the user. In this article, we’ll take a little time to discuss the ethical use of magic, and how to avoid it’s unintentional misuse. When one prepares to work magic of any kind, one of the first questions one must ask themselves is “What is my intent?”. It has often been stated that magic is energy, charged with intent, that keeping ones target or goal in mind is of absolute importance if you wish it to be successful. But what does this actually mean, and how might one avoid an unintended folly. Let’s take a look at one of the simplest forms of magic, candle magic. The basic mechanic is you charge a candle with intent during meditation, often apply some form of ‘booster oil’ that contains the properties synergistic with your goal. It is during the preparation stage that one must take care not to cross the line into harmful or manipulative magic. Ooops! It may seem harmless, but one must consider the implications of such a simple phrase. “Let me get this promotion” is not completely harmless. Someone else may be lined up for that promotion, someone who is just as skilled, or even more so, and perhaps even more deserving of that position. Your magickal working could sway the opinion of your joint superiors into giving you the job over them. “Well good! That was my intent!” Well, if your intent was to deprive someone of a position they richly deserved, then perhaps you were checking this article to make sure you WERE practicing on the dark side of the art. This specific application of this type of spell work lends you to obtaining something that isn’t yours, at the expense of another, thus causing harm. Works that cause harm are the very definition of ‘black magic’. Instead, in this case, one might concentrate on “Having enough money to meet our needs” or envisioning a specific desire “Have enough money to purchase this vehicle.” In both these cases you are leaving it open to the universe to bring you that which you truly need, without impinging on another persons. The universe does not pick up occupied property, that is rarely the path of least resistance, instead this can alter the course of something suited for you, that will meet your needs, to flow to you free of karmic interference.